The health and wellness trend is pushing the demand for concentrated tomatoes in Asia Pacific. The emergence of a new demographic of urban, diet-conscious individuals has led manufacturers across a wide range of spectrum to include concentrated tomatoes in their offerings. The gains are particularly significant in cosmetic and personal care industry, where a flurry of concentrated tomato based skin care products have made their way to the market. The Asia Pacific concentrated tomatoes market is in ascendancy, and a new study by Fact.MR maintains a bullish outlook on the market. The lycopene-rich nature of concentrated tomatoes has been instrumental in increasing its adoption among end-use industries – ranging from personal care, food & beverages, and pharmaceuticals. Lycopene’s antioxidant properties are well-documented, and rising awareness among consumers is creating significant opportunities for manufacturers. 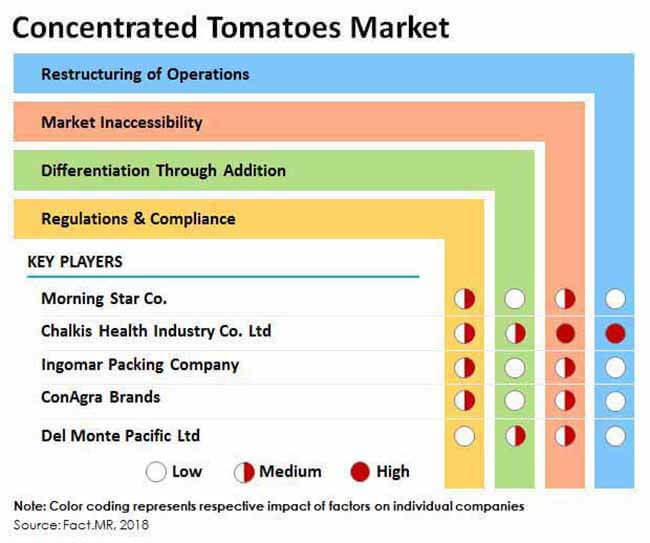 According to the Fact.MR study, skin care industry will continue to be one of the largest end-users of concentrated tomatoes in Asia Pacific. The other key industries where concentrated tomatoes are likely to witness high demand include pharmaceuticals and food & beverages. The pervasive trends pertaining to “organic” and “natural” are likely to have an influence on the production of concentrated tomatoes in Asia Pacific. In developed markets of North America, there are growing clamors towards greenhouse tomato production – a method which involves use of alternative soils for environmental conservation. Although the concept is at a nascent stage in Asia Pacific, it is likely to gain attention from consumers who now focus on the entire supply chain rather than the end product. Get in touch with the author(s) to know the methodology employed to create this report. Although Fact.MR maintains a positive outlook on the concentrated tomatoes market, challenges pertaining to price volatility and sourcing of quality raw materials can stymie growth during the assessment period. The report also finds that decrease in the production of tomatoes will have a negative influence on the prospects of manufacturers. Worldwide production of tomatoes is likely to decline in 2018 – this can have implications on availability of fresh tomatoes for producing concentrated tomatoes. Low tomato production is expected to impact the demand and supply scenario of concentrated tomatoes. This is further likely to hamper growth in revenue of the concentrated tomatoes market. The Fact.MR study also offers in-depth analysis and insights on the sales channels in the concentrated tomatoes market. Concentrated tomatoes are currently sold through modern trade, drug stores, departmental stores, direct sales, and online stores. Among these, online sales of concentrated tomatoes are likely to remain impressive during the forecast period. The proliferation of e-commerce in the retail sector is likely to create new avenues of growth for manufacturers. These factors are likely to augur well for the prospects of concentrated tomato manufacturers during the assessment period. The Fact.MR study also profiles the business and product strategies of some of the leading players in the concentrated tomatoes market. The innovations, new product launches, merger and acquisition activities, and overall business and product strategy of these companies has been discussed in the research study.